OEM and enterprise customers using Windows 10 IoT Core can take advantage of device management configuration service providers (CSPs) that allow some control over the device update process. Starting with Windows 10 version 1703, IoT Core Pro is discontinued and update control is enabled in IoT Core. WSUS support is also removed. Device Management Policy can be set using either the Windows Imaging and Configuration Designer (ICD) tool or a mobile device management (MDM) service. See Mobile Device Management for more detail about device management protocols. Reboot the device. On the next boot, the ppkg will be processed and the settings will be applied to the device. 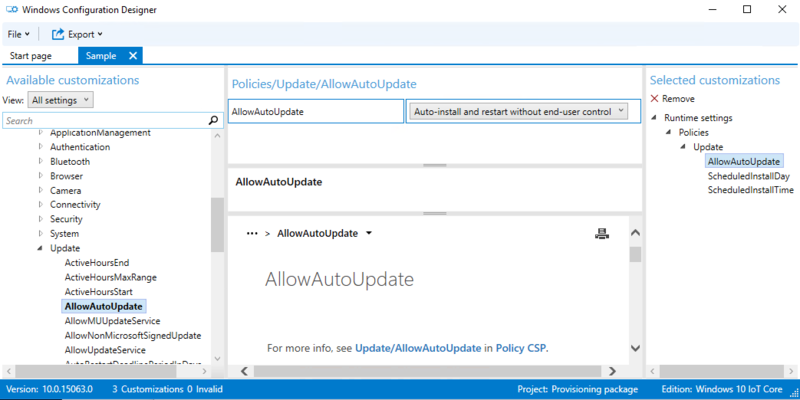 Updates for IoT Core can be turned off by setting the AllowAutoUpdate policy. 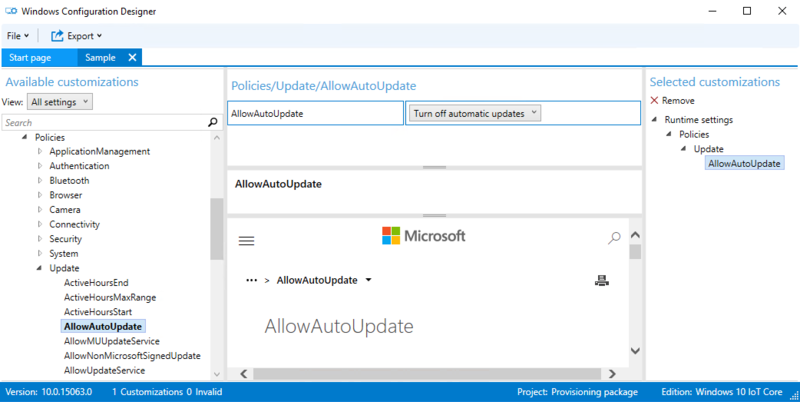 If the AllowAutoUpdate policy is not configured, it defaults to Auto-install and restart, devices will get IoT Core updates and install immediately and reboot after ActiveHours. If the AllowAutoUpdate policy set to Turn off automatic updates, automatic updates for IoT Core are turned off. If the AllowAutoUpdate policy is set to Auto-install and restart without end-user control, IoT Core updates will automatically install and the device will restart at a specified day/time. An IT administrator specifies the install day/time (i.e., every Sunday at 3am). If no day/time is specified, the install time defaults to 3 AM daily. All end-user update related notifications are suppressed as well. View the set day using <LocURI>./Vendor/MSFT/PolicyManager/Device/Update/ScheduledInstallDay</LocURI> or time using <LocURI>./Vendor/MSFT/PolicyManager/Device/Update/ScheduledInstallTime</LocURI> in syncml. 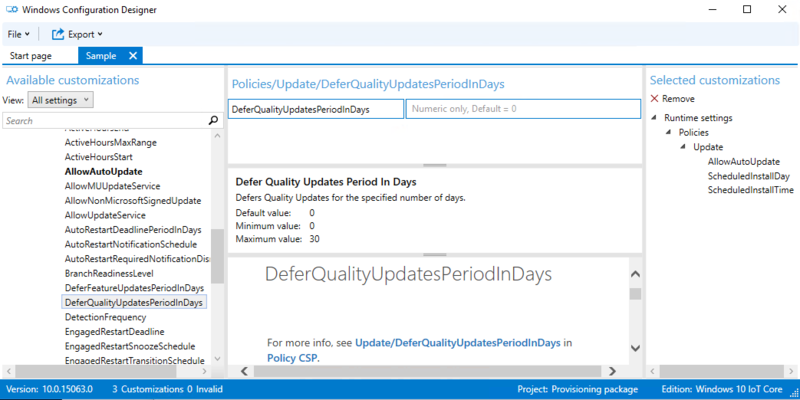 DeferQualityUpdatePeriodInDays policy can be used to delay the update of the device by required number of days(max 30 days). Azure IoT Device Management (Azure DM) is a highly scalable management solution available on Windows 10 IoT Core. See Windows Update Management for the details on managing the updates using this channel. Azure DM also provides ability to set the flighting ring ( see "ring" property in Windows Update Policy ) and control the reboot of the device via Reboot Management.